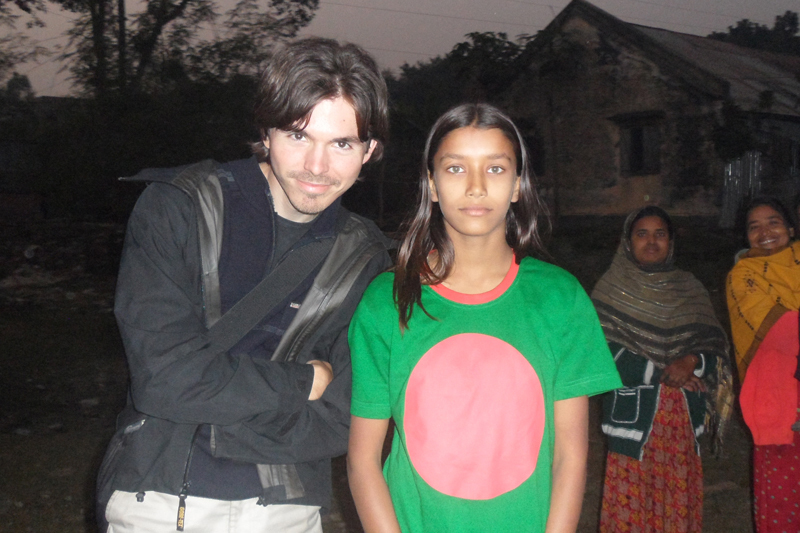 My photos of Tuly, the Bengali girl with green eyes, have been popular with people all over the world. 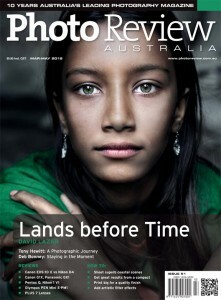 She has appeared in photography magazines such as Digital Camera World, Photo Review Australia, and is on display and for purchase in book and postcard form at the Travel Photographer of the Year exhibition and shop in Kent, London. I thought I’d share the story behind meeting her and taking her portrait. I only wanted a quiet moment to sit down and rest after a day of exploring and meeting people in a small rural town in Bangladesh. I had been answering the same questions all day: what is my home country, am I travelling as one, and what is my opinion of Bangladesh. I sat down on a grassy hill which overlooked a group of small houses, where the neighbours were outdoors talking and playing games together. It might have only been about 30 seconds until I started to attract a crowd – but this was really no surprise. I was travelling around Bangladesh for four weeks in December to January 2012. I was travelling as one, but one is never alone in Bangladesh. It’s the people that make this country a great place to visit – I found them to be the most hospitable, curious, outgoing, and open-hearted people I’ve yet to meet. So when I realised that I was going to be the new centre of attention I got up and started to interact, and joined in a ball game that was going on. People were unafraid to use their broken English and ask me lots of questions. The sun had set and the light was getting low, so I knew that photos would be out of the question. But I saw a girl in the group who really caught my eye – she was wearing a bright green t-shirt with a large red circle on it (the Bangladeshi flag), and she had strong green eyes that matched her shirt. I knew she’d make a great subject for a portrait photo, and I had always wanted to capture a close up portrait of a person with striking green eyes. I introduced myself to her and complimented her on her beautiful eyes. I asked her if I could come back the next day in the afternoon to take her photo. She agreed. I came back the following afternoon and her older sister Duly, who spoke some English, could act as a translator. I was invited into their house to meet the family, and was brought tea as well as a present in the form of a notepad. Tuly took me on a tour to see her bedroom, which was well decorated and filled with artworks that she had created – she had told me she wanted to be an artist. When we went to take some photos, I decided to take them on the front steps of their house. I noticed that while it was fairly dark under the awning, the cloudy sky was providing a nice even, natural light through the gap in the roof which would result in a concentrated, directional light source. The even light from the sky worked well with the subject who was in a reasonably dark space and the natural light formed smooth shadows on her face. The background was therefore rendered to be dark and non-distracting, which is important in a close up portrait if you want the attention focused on the subject’s face. I knew that having Tuly sitting down and leaning on her knee would create a more relaxed and natural posture rather than a rigid standing pose. I also wanted to try some shots with a headscarf, as framing the face with material or an object can help bring focus to a person’s eyes. I asked if she had a green scarf or veil in the house, but she did not, so instead someone brought out a red scarf which had green patterns etched onto it. We then did some photos with her face wrapped in this scarf. Here is one of the original photos compared with the final edited version. The first thing I notice with the original photo is that it’s a bit dull, and there is room to boost the brightness in the photo. In Photoshop I do that by creating an adjustment layer and going to levels, and sliding the far right white triangle on the graph to the left to bring more whiteness into the photo. As soon as the bridge of her nose becomes over-exposed I stop. I repeat this process again by making another adjustment layer on top of the previous one and make the photo brighter, but by using a layer mask I can have more control and paint in the brightness effect – so I’m choosing which parts of her skin become brighter by painting the effect in with a brush. I make sure the layer mask is filled in with black (control + I will invert the mask from white to black) and by using a white paint brush I reveal that layer again but just in the parts that I want to brighten. I also keep changing the opacity of the brush to control the strength and how much brightness is being added. The next thing I notice is a blue tinge to the photo which I often see in portraits from my Nikon D700 taken under cloudy sky lighting. I want whites to be white and not have a blue cast, and that’s easy to desaturate out. I make an adjustment layer and choose saturation and choose the Blues and Cyans and pull the saturation sliders right down to something like -70. However this removes blue from every part of the photo, and I don’t want to change the shades of green in the scarf and her eyes, so again using the layer mask I’ll make sure those parts of the photo aren’t effected, by leaving the mask white and choosing a black paint brush and painting on the eyes and scarf (so the blues are not desaturated from these parts of the photo). As well as making the highlights on her skin a bit brighter, I also make the shadows on her face a bit darker. I have boosted the brightness in her eyes, but did not change the colour of the irises. I’ve brought out the colours in her scarf to make them a bit stronger and richer, and I have cropped in slightly for a tighter composition using the crop tool set to 4 inches by 6 inches to keep the normal photograph dimension ratio. I also like to sharpen the fine lines on the face such as eyelashes, irises and the lips. I usually use a high pass filter on a new flattened layer, set the blending mode to overlay, and paint in over the parts of the photo I want to be sharper. I always make use of layers and layer masks in Photoshop so I can ‘paint in’ the effects and choose exactly which parts of the photo gets treated, no matter what the treatment (lighting, colours, sharpness etc). A lot of subtle changes lead to an overall look that fits my aesthetic vision which is to have natural looking photos that are sharp and perfectly lit, and also have a colour scheme with complementary colours working together throughout the photo. When Photo Review Australia magazine approached me and asked if they could do a feature on my travel photography, they said they wanted to use one of my Bangladeshi girl portraits on the cover. 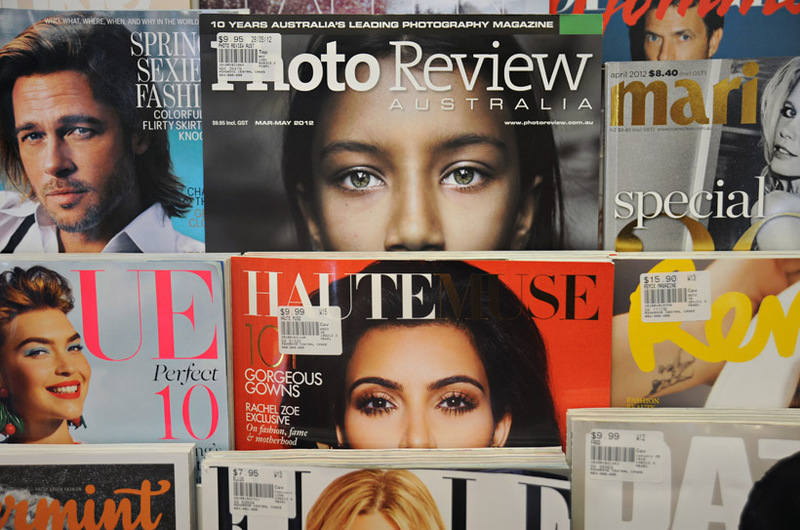 As a result, Tuly has appeared in shops across Australia, and I would hope that she would be excited to learn that our little interaction in her village has led to people admiring her beauty and elegance throughout Australia, and the world. 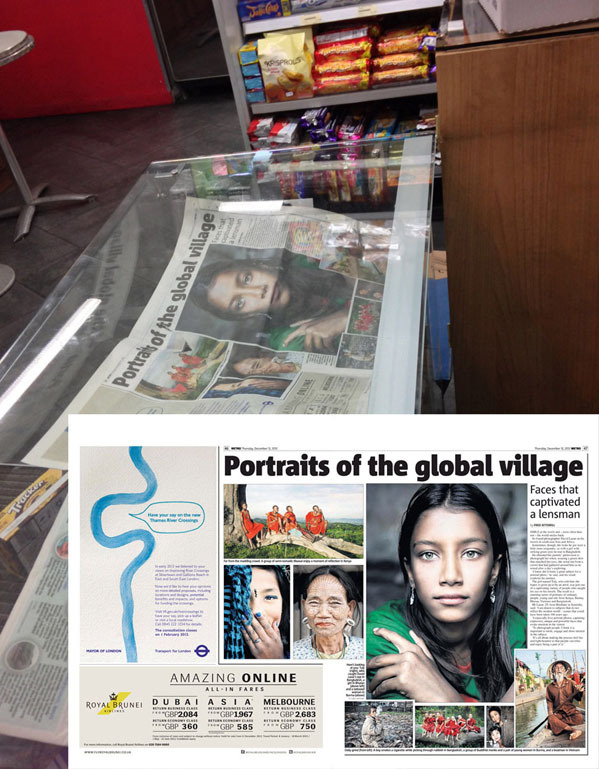 I took a trip to my local newsagent to take a photo of her picture on display (above), and bought an extra copy of the magazine to take with me when I return to Bangladesh and retrace my steps to find Tuly again, and give her the copies of her photos and prints in publication. Find below some other mediums the photos have been printed in. Thank you for sharing the story. The photo has a similar impact on me as Steve Curry’s National Geographic girl from Afghanistan did 20 years ago. Stunning. Evocative. Timely. Best to you in your work, you are an extraordinary photographer. I look forward to the fruits of each journey. Thanks for sharing some of your technique and as well the story – fascinating and interesting!! The shot very much similar to the Afghanistan girl some time back. Sitting here in Bangladesh, I find it so surprising that we didn’t find what you did in just one visit (!) – cheers to you and your beautiful pictures – wish more to come and from Bangladesh, my homeland as well. Hi David, I become your true fans! It’s amazing! It’s also a great sharing of your editing process. I can’t believe that the aussie guy i met in Motherland Inn was a top notch photographer, and he was so nice! that’s you! haha! Keep on amazing us with those stunning faces! it’s really nice work. just awesome…. David, Tuly es hermosa ¡ Tu fotografía ,como siempre espectacular, pero con la narración que haces sobre como y donde conociste a Tuly le das alma. Gracias por compartir la fotografía y la historia de ésta. Espero más fotos y más historias. Un abrazo desde México ¡¡ Felicidades . dear David, it is really a nice amazing writing. the photography is outstanding. feel proud of that Bengali girl of green eyes. thanks for sharing such an amazing writing. wish to read more, wish to see more and more photographs. many many best wishes to u.
I would like to thank you for the efforts you have put in writing this site. I’m hoping the same high-grade site post from you in the upcoming also. In fact your creative writing abilities has encouraged me to get my own site now. Really the blogging is spreading its wings fast. Your write up is a good example of it. very very nice work……I become your fans! It’s amazing! I love this photograph and for so many reasons. First of course is the world class technical prowess and expertise of the mastery of the photographic medium: Beautifully composed, amazing capture of light and wonderfully processing for RAW into the final image. But the main reason I love it is because of the human story it tells. Such beauty and innocence which also captures the beauty and innocence of the country of Bangladesh. I have been there many times myself (see my FlickR album – http://www.flickr.com/photos/toffaelrashid/sets/72157630855587266/) and as you rightly point out, though on the surface is a relatively poor country, in fact Bangladesh is one of worlds richest countries in terms of natural beauty, character and culture. 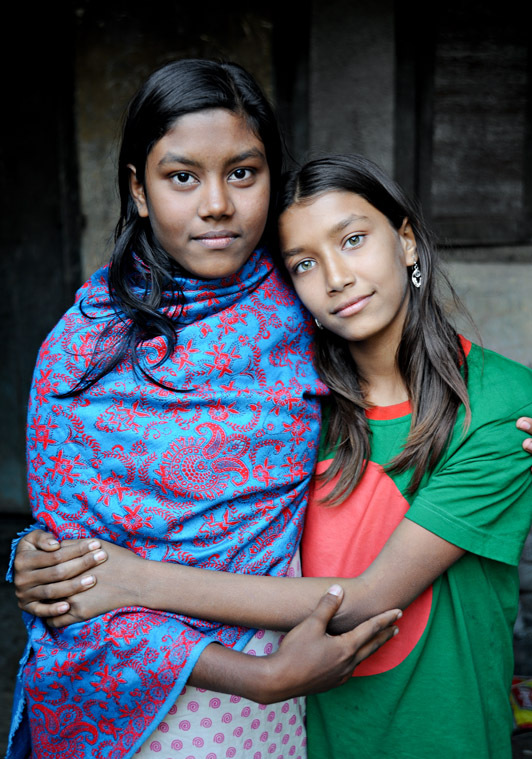 PS: Would love to see all your Bangladesh work if you are willing to share. I have an extensive audience too. Thanks very much. I’m glad you liked it and would like to see more – and you can as there is the Bangladesh album in the Gallery section. All the best. This is very nice writing. Outstanding photography and Wildlife and Warriors Collection have awesome Photograph. Wildlife Photography is my hobby also. Thanks for sharing such an amazing blog post. I wish to read more. I wish to see more photographs by you. I wish all the best to you. Thanks Scott – glad you enjoyed it! I really enjoy reading about how you work, both when you are on location and interacting, as well as in post processing. Along with sharing your amazing experiences and providing background stories on your images, you should continue to share your processes and techniques for aspiring travel photographers. I’d also be interested in learning more about your equipment and travel photography “must-haves”. I can’t wait to read and see more! Your work is inspiring! That’s good to hear, Ashley. I like sharing the process – so I will keep doing so in future blogs. Thanks. I have been a photographer for almost 40 years and I have photographed many beautiful models, but I’ve never found one with such beautiful eyes, what an amazing photo, congratulations. thank you for sharing this beautiful life experience……its a blessing that you come across a lot of such incidents in your quest for capturing the world around…..needless to say that you have given a new dimension to the photography by clearly communicating with the world the many aspects of life through your praiseworthy photos, which are very vivid and captivating……. we all are very much indebted to you for sharing all those your wonderful creations in this site…….really enjoyed them all, especially ‘the monks of Burma’…….love you…. This is funnily enough just the thing I’ve been rummaging for! Fantastic and thankyou! I was looking at your pictures for hours while listening your music. A completely new approach to art housed in my mind. Thank you for the wonderful experience. You will hear about me soon with some hopefully enyojeble result of my artwork. 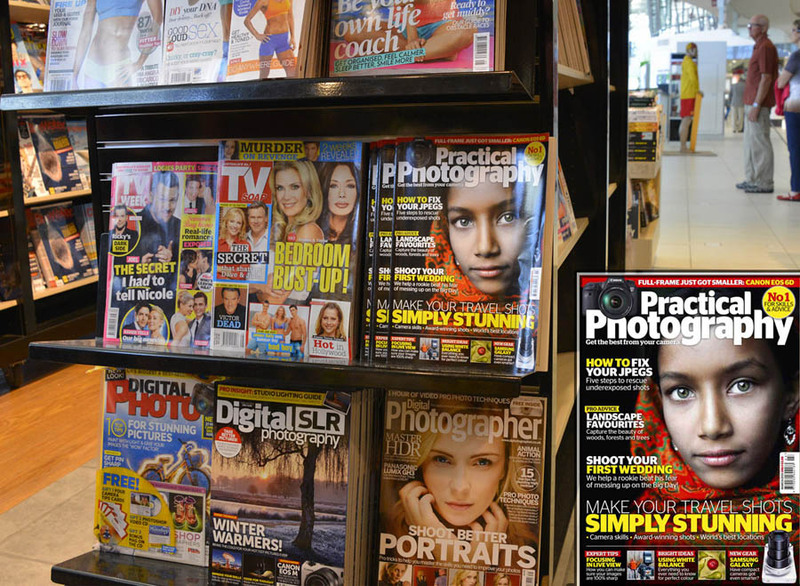 you may think that taking this photo is benign, that profiting off of this girl’s appearance doesn’t hurt anyone. but the attitude that people like me are a commodity is rampant, and photos like this contribute to it. i am sick of being treated like an alien, like an animal, like a whore. i am a person and so is this girl, whole and complete and NORMAL. we are not other, we are not “exotic,” we are just us. i hope you are all ashamed of yourselves. Wow! This is wonderful! Amazing! I am lost for words! 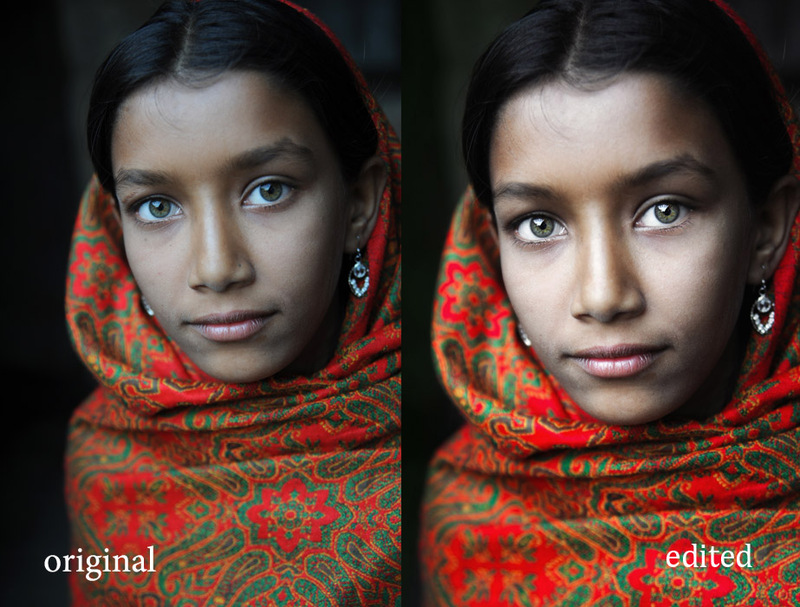 Blue eyes, green eyes are completely unheard of in Bangladesh. Well, it’s a rare sight all over the world! Without the picture I would have never believed it. Now, I think he might have been true. Thank you for taking that picture! Thanks Usama. Yes also in India and some parts of the middle east like Afghanistan you can see people with green eyes. And yes definitely there are a handful in Bangladesh too. Maybe more rare in BD though! Green eyes are rare in Bangladesh.But there are many people in Bangladesh with green eyes.I’ve seen atleast 100 Bangladeshis with pure green eyes. for shearing this photos,,Its a wonderful. because hers eyes also she wore Bangladesh national flag both are such a wonderful!!!!!!!!!!!!!! thank you of these beautiful pics you shared with us. World is amazing and colorful – and you surely had your moments to get them with your camera . And with such a positive attitude…. I will follow your work from this moment. Thank you again. Her beauty truly reflects Bangladesh and bengali people.. Please take more pictures like this! Thanks so much for the brilliant pictures. I would more like to applaud you for highlighting the humbleness and spirit of the Bangladeshi people. Bangladesh gets on to the media for the wrong things, but good to see people like yourselves provide another side of the story. dear David, it is really a nice amazing writing. the photography is outstanding. feel proud of that Bengali girl of green eyes. But I have an another amazing news that she is not only one of Bangladesh … i saw her about 1 years ago in Dhaka new market with two relative…I try to very close her to confirm that is she..? yah i & my friend Newto shocked at first sight … u can’t believe she is one of with her green eyes…!!! but i cant take her … she was lost ever……. i didn’t find her ever… She was about only 13th..it’s amazing……….. The photo is beautiful, as is the girl. Flawless. natural.. I love how you described Bangladesh, it warms my heart, if only more people would see my home country like that! Love your work, and very grateful for your post work comments. They really help aspiring photographers. I travelled as a solo female around Bangladesh this Feb (2013) it was a great place and I was treated with respect and courtesy by the local Bangladeshis – although yes, it was a challenge, and I attracted A LOT of attention outside of Dhaka!! I found your website while I was surfing the web for beautiful places to visit in Bangladesh while in Dhaka. Tuly is a SENSATIONAL find – she is stunning and could easily be an international catwalk model! I am truly inspired by your photography, I’ve spent a lot of time in Asia over the past 4 years, including 2 visits to Myanmar, and it’s clear that you spend time with, fully relate to, and completely identify with the people / country you’re photographing and this comes across in the image – your approach sets you apart completely from other travel photographers. AMAZING – please keep on travelling to other countries and taking more beautiful pictures!! Sarah it’s certainly an unforgettable experience to travel around Bangladesh – and I’m glad you came across my images while in Dhaka. Thanks for the kind words. Thanks for the sweet notes on us Bangladeshis. You certainly have good eyes to see through crowed I must say. I have been traveling all my life yet never really found eyes could be of great subject, now I understand I havent seen enough and I have limitations too. please come back my country puthia,bangladesh. 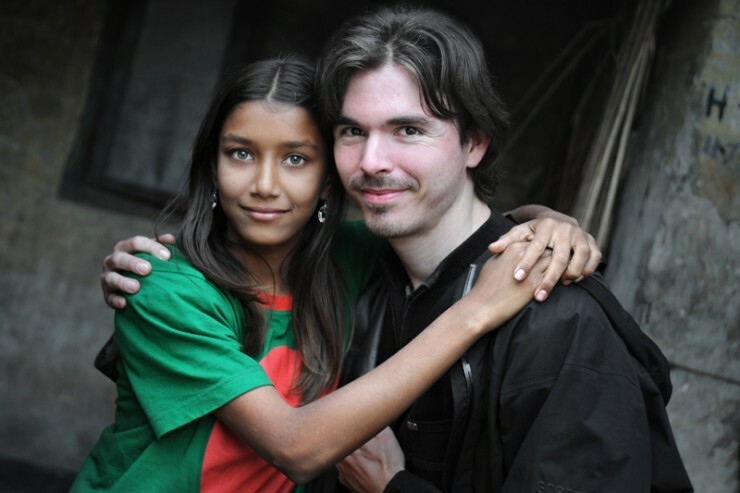 Waiting for you………..
great work and words David….. greetings from Bangladesh. Thank you and great work David. It is really amazing that your rendering is also beautiful like your photos. Thank you and I appreciate your time and effort to write the stories behind the photos. One more thing sir. If you give me her address , it will be very helpful. . Thank you sir. David, please do not disclose addresses of your subjects to people who may have negative backgrounds, most are children, exposed, should also maintain their innocence as children and should not be be fed to otherwise, evil. Donna, agree with you 100%. Thanks for publishing this kind of capture & just today i here it from our prothom alo newspaper and the link http://www.prothom-alo.com/we-are/article/353143/%E0%A6%B8%E0%A6%AC%E0%A7%81%E0%A6%9C-%E0%A6%9A%E0%A7%8B%E0%A6%96%E0%A7%87%E0%A6%B0-%E0%A6%B8%E0%A7%87%E0%A6%87-%E0%A6%AE%E0%A7%87%E0%A6%AF%E0%A6%BC%E0%A7%87%E0%A6%9F%E0%A6%BF and again thanks to you. Thanks for sharing the story & to highlight Bangladeshi people over the world. 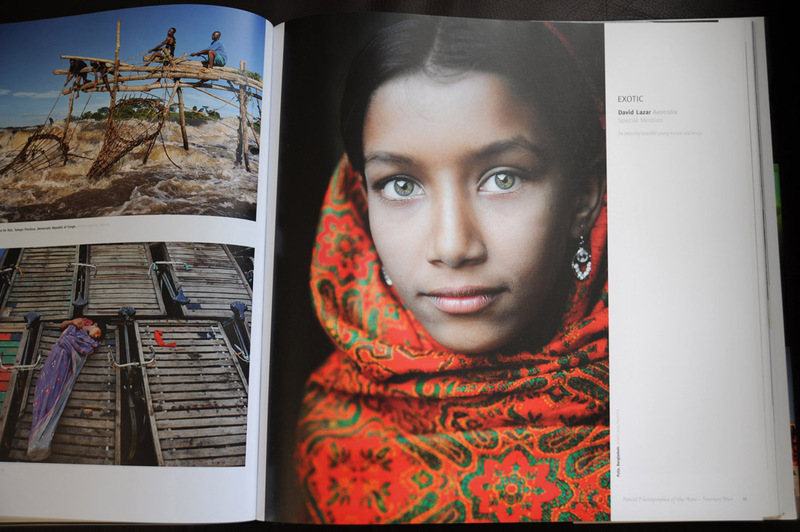 I love the article and I too am enthralled by the beauty of those amazing green eyes of the young girl from Bangladesh. As a Bangladeshi myself, now an American, I am curious to know if Tuly has been duly compensated for letting you photograph her. Her face is in all those magazines and obviously bringing you kudos for what you have done with your lenses and talent, but I really hope she will get something in return other than just a hug, a smile and a thank you. I an sure she could benefit from help with education and if you set up a scholarship program for her, that would be the best way to help her. I hope you will do that, if you have not done that yet. I as a reader will contribute and I am sure many others will gladly will too. That is a beautiful picture. There are some other people in the Kaliganj area near Dhaka who have blue and green eyes. That is an area where (apart from Goa) the Portugese have been in the colonial days before the British colonised India and left their blue/green eyes behind. Can be the subject of an interesting sociological study. I was referred here by a dear friend who is from Bangladesh. I’m grateful to him for that and to David for sharing the story. We can learn a lot from the gentle dignity of the Bangladeshi people. I once heard a lady describe her sister as being “cursed with beauty”. I hope Tuly’s experience with fame and publicity is a positive one. Just Love your Photography. Thank you very much for your Sharing and invite you to travel our Beautiful Bangladesh. For shearing such kind of working experience with all over the world and Bangladesh as well. I feel proud. I would like to invite you here in Bangladesh to enjoy our hospitality once again…. awesome edited by Bangladeshi photograph!!! Oh wow very mesmerizing pic,her beauty lies in her eyes, its like you can read her soul. It’s really nice job. trying to find them. who inside the darkness. Hello, your photos are amazing! Tell me how you get such beautiful solar patch in the eyes in your photos? I can’t wait to read and see more! Your work is inspiring! It’s the natural catch light in their eyes that is then brightened some more to make very clear and often pure white. In the case of these photos, the catch light is a reflection of the sky between between two roofs above. Hi David, did you ever make it back to Bangladesh? Is Tuly even aware of her flash of fame. A little follow up piece would be such an interesting read. AYUDA A ESA CHICA A SALIR DE LA POBREZA EN QUE SE ENCUENTRA, NO LA DEJES SOLA. wow, it’s really amaizing. Thanks to David Lazar for taking such kind of capture. such a nice story as well as your photography!!! what you have caught in the film actually represents the reality of rural people of Bangladesh.It’s an amazing work!! And obviously thank you very much for admiring the people of our country and mentioning it as a great place to visit.when someone says something good about my nation and my country it really touches my heart.I wish I could do some work like you!!! Come again to bangladesh.We want to treat you again. I am interest to meet that beautiful amazing girl. will you provide the location of her home. Beautiful eyes ….n so nice photography..